Chicks: Where are the Parents? Question: Sometimes when I look at the webcam there are no adult birds in view. Aren’t they afraid their eggs or chicks will be attacked? Where are they? Answer: They’re there. You just can’t see them from the camera’s narrow view. At times when “no parents are there” on camera, I have been at Schenley Plaza across from the Cathedral of Learning and seen a parent bird perched just two feet above the nest, watching the babies. 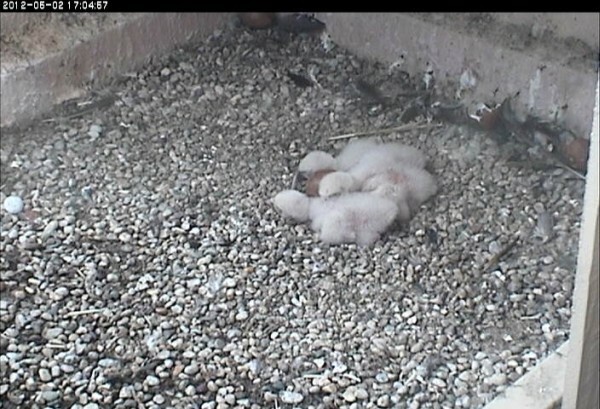 In this photo the weather is warm and the chicks are sleeping. Don’t worry, the parents are guarding them. Hi, I teach first grade in the Connellsville Area School District ….my students and I have been watching the fledgelings since last Tues. we have it on all day . They are so excited especially when they can see the babies…what a wonderful learning experience for all of us. Thanks Kate!!! I was getting concerned because neither parent was in the scrape. Thank you for putting my worries to rest. NO MORE DRAMA!! There is only C1. What picture is this?